This Sunday marked the first Advent here in Sweden which is known as "Första Advent" for people who are obviously not Swedish like most of my readers are not, Advent is basically the Swedish countdown to Christmas and this weekend was the first one out of four. So with the first advent up Marie got into the Christmas spirit like always, me personally am not one for Christmas i don't know why it's just not a season that really excites me (I know shocking! i'm probably the only person in the world that says that) but it's true. Don't get me wrong i love Christmas for the children but myself i ain't that bothered if it comes or not kind of thing. This is the Advent Candles that get placed wherever really, we have ours sitting in the kitchen on our kitchen table but some people have them in their livingroom's etc but this is what we light every weekend on the run up to Christmas to mark each Advent. It's quite strange to me but it's really exciting for the kids so you just got to love it for them really don't you. But Sunday came and it was time to start putting up the Christmas decorations, we haven't got our tree up just yet as we normally do that the week before Christmas, although i think we might do it a little bit earlier this year since the twins will be away with their dad on the weekend that we are meant to do it, and although most of the time they just get in the way and end up annoying you while your trying to mess around with stupid fairy lights and tinsel it's still a exciting time for them and they should be a part of it i guess. For some reason like the American's i guess the Swedish are absolutely fascinated with lights, granted we don't go to the extreme of decorating the whole outside of our house in fair lights and big Santa Claus's and such likes but they have to have these lights or other types of lights in nearly every window of the house, it's great for the kids though since every year they get there big star in the window. Alexander has quite a similar one and i don't know why but they love them, i guess it just makes it feel more more like Christmas in their bedroom, plus a extra night light at the same time, but unfortunately one of our stars broke last year that was situated in the boys playroom so Marie went out and bought a special one for there, and the kids loved it! We still have a few decorations to put up though, but we cannot seem to locate them. They are actually not something the Swedish people put up but my parents brought them over a couple of years back when they came to celebrate Christmas with us and the kids fell in love with them so once we actually locate them, we will need to put them up to, just to make it feel a little bit more like Christmas as our livingroom is a little bit dull even though we have our mini Santa Claus figures and lights up on the window. But i think that is all for just now, until next time have a great day! and get ready for the stream of Christmas themed posts to come! Since the boys have started school, the school has been taking them every Wednesday to the local library here in town so that they are able to get some books to take home and read. For me this is probably one of the most greatest things that our schools here in Sweden do, i recall being back in school at their age myself and i can not once remember the school taking us to the local library to check out books. But of course with this comes some problems, and the main one being the question on a Tuesday night "Where the hell is that book!" and that is exactly what happened last Tuesday. 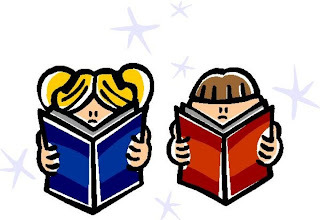 When the kids had returned from School Marie had taken out the little receipt that the library provides with the list of books that each child has taken and asked the boys to go and get the books they had taken so that we could check them off the list to be returned the next day. However Alexander had apparently misplaced one of his books and no matter how much he searched he could not find it anywhere, now we had made the big mistake of allowing them to take the books up to their playroom which for anyone with children will know a child's designated playroom is ALWAYS like there has been a war going on. There is toys, books and all sorts lying around up there, and no matter how many times we tidy the room up and ask them to tidy the room up no later than 5 minutes later the room is exactly the same way again. But children will be children and you cannot expect them to be all neat and tidy, especially when you have twin boys. So of course when we found out that a book was missing the hunt for the book began, we began by telling them to go up stairs and tidy the playroom up in the hopes that he would be able to locate it as they put things away, but after a hour of cleaning they had still not found the book at all, so the search began and let me just say it was a very long one. We searched his bedroom which was absolutely spotless i mean for them creating such havoc in the playroom they really know how to keep their bedrooms nice and clean but we could not find it there either. After a good hour of looking up and down the stairs we eventually found the missing book, and you wouldn't believe where it had been placed, out of everywhere it could have been located for example under the sofa (Yes the kids have 2x 2 seater sofa's up in their playroom for when they're watching DVDs) or some place like that logical places i would call them we finally located the book and where was it? It was sitting in the hole of the cats scratching post! Like really? I have no idea how it ended up there or why Alexander or Maximus decided that the hole of to the cats scratching post would be a great place to put a book that wasn't even their's but that was exactly where it was. I guess they thought that while our cats were sharpening their claws on the scratching post that they would like some reading material, you know like when men go to the toilet and they take a magazine just for something to do. But i really have no idea. So in total it took us nearly 3 hours to find this one book, i was kind of glad that we did locate it though, because we certainly did not want to pay the fine that we would have received. It's pretty safe to say that we have learned out lesson on that one and have banned them from taking the books up to their playroom or anywhere else for that matter, so combat the problem we have gave them a space in the bookshelf we have in the livingroom now and if they want to sit down and read one of the books they have taken from the library then they can sit in the livingroom and do it. At least until the point where they get a bit more responsible. But for now i think i shall bid you all farewell, so until next time! Have a great day. Seeing as every other blogger around seems to do a Wordless Wednesday, i thought i would jump on the bandwagon! 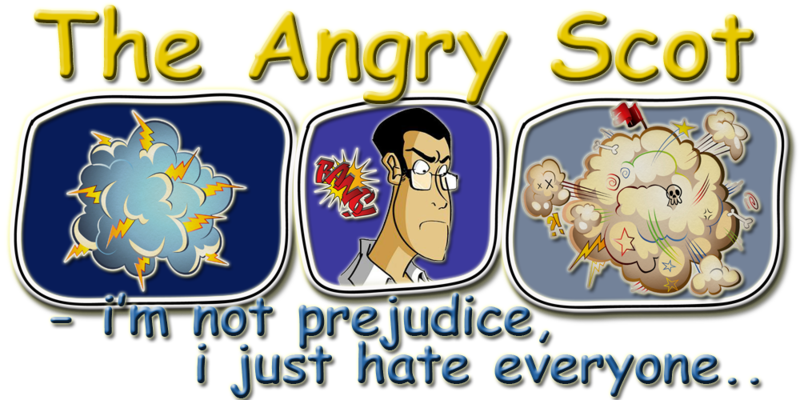 So for the first time in the Angry Scot history, here is my Wordless Wednesday picture! Picture was taken during our summer, when we visited Sommarland here in Sweden, i don't know why but every time i look at this picture i just smile, it could be something to do with the look on my oldest daughters face or the fact that i see how much fun they were all having, either way this is one of my most favorite pictures of all the kids together. I would like to start of by saying having twins is probably one of the most amazing and challenging things any parent can have, on one hand you have all the stuff that makes having twins great. The fact that they have a friend they can always play with who is exactly the same age as themselves, then you have all the firsts that you get to experience with your child growing up, like first step, the first word and the first everything else but you get to experience them twice! But you also have double the trouble and my little boys are definitely the definition of the word trouble, not all the time granted sometimes they are the sweetest little boys you can possibly imagine and then sometimes the devil horns come out, but it's not just one it's TWO! I would ask you ignore my bad attempt at Photoshop. As of late my two little devils have just become that, they absolutely refuse to listen to anything, it's like we don't exist and if we do they don't care. Last night they asked if they were able to go up to their playroom after dinner and play with their Lego. So Marie had started her sentence and just before she got to the point of saying so you guys get one chance, Alexander jumps into the conversation with "We know one chance"
It was more than obvious that he hadn't paid any attention to the rest of the conversation but he already knew what his mum was about to say and decided he would take it upon himself to finish the sentence for her. But we decided that we would let them go up and play even after the bit of cheek, but sure as i am sitting here what happens after not even 30 minutes of being upstairs apparently playing, we hear that god awful laugh, now i love to hear my children laugh i really do, i think a child's laugh can make a day that is going really bad really good and uplift your spirits, but my little twin boys have one particular laugh and when this laugh occurs you know without a shadow of a doubt that they are not playing anymore and are doing something they shouldn't be. So instead of going up and trying to see, since it never works and they always hear us coming up the stairs we decided to just shout up the stairs to stop whatever they were doing and play nicely, but 10 minutes later once more the laugh of destruction i think i will call it began again. Of course seeing as this was the second warning it was automatic "Alexander to your room and Maximus to yours" and that was the end of play. The only thing that i cannot seem to work out is why won't they just listen the first time, i wouldn't say my children are spoiled because they ain't, but they have plenty of toys and other things upstairs that they could be having fun doing and yet when we let them go up and play on their own there little devil sides come out and they start getting up to mischief, and after repeated warnings still refuse to listen. We are even at the stage now where Santa is watching them and if they don't behave then he will strike one item of their Christmas list until all they have left is a piece of coal in their stocking but even that doesn't work!. I would normally put this down to a phase with them but seeing as it's been on going for the last 2 years i doubt that it's that. Granted i would not change them for the world, even though they get up to stupid things on a daily basis and find themselves in their bedrooms playing alone on most days when you get that little 10 minutes of bliss and you see them being all sweet and nice it makes everything worth it. I never thought i would ever experience twins but i am so glad that i have, because having one child is awsome but having 2 identical children is just even more fun. I just wished they would learn to listen to us! But i think i shall bid you farewell for now, so until next time have a great day!. No before anyone jumps to the conclusion this is not a birthday post, actually most of you by now are probably aware that they already had their birthday but just for the folks that didn't i thought i would clarify that, but no the reason they are growing up is because for the first time ever on Sunday they played their first Xbox 360 game. Ok so not a massive deal for most i guess, but seeing as i am a gaming nerd it's HUGE for me, i mean it won't be long now until we can all play games together and play against each other, and i think that is brilliant. Seeing as the twins are only 6 it's not like we have lots of stuff we can do together except play with toys so them being able to get into something that i myself enjoy doing just makes me one very very happy daddy indeed. But myself and Marie had been talking on Friday night about what to get them and Marie had suggested that we could perhaps see if we could pick up a game or two for the Xbox for them, i personally thought that them being 6 was perhaps a little to young, seeing as the Xbox controller can be pretty fiddly with all those buttons and the movement button being a little stick that you have to move around, but Marie felt that they had to at least begin to learn. 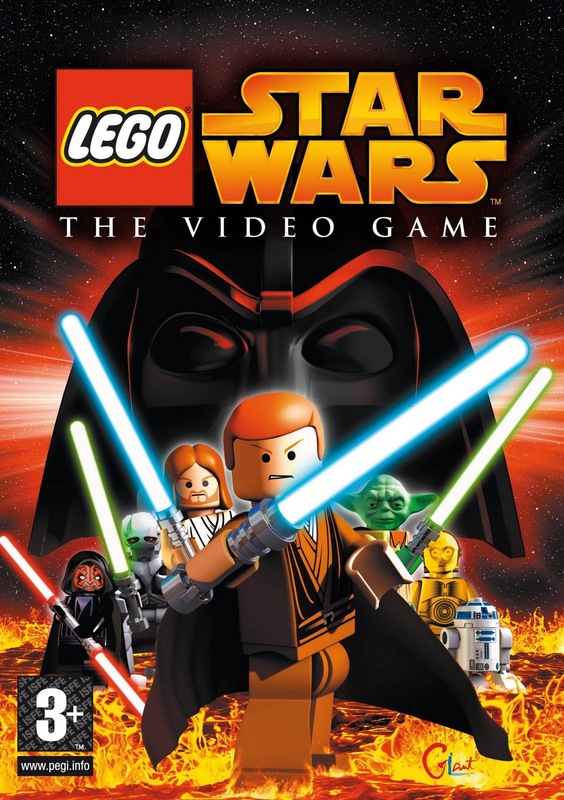 Seeing as they are into games and into Lego we started to take a look at some of the Lego titles that they have out for the Xbox 360 and low and behold they have Lego Star Wars! i couldn't believe it, so i think we shall probably end up getting a copy of that for them for the Christmas which will be excellent, the game itself after looking on YouTube seems pretty easily played for all ages so i don't think they will have any problems once they get to grips with the buttons and it also has a extra person running around with them so that a parent can jump in at any time and help them if they get stuck, or they can just run about together in circles having fun. So yesterday we decided to give them a little shot, unfortunately i only have grown up titles so the choice was limited for them to play but we let them have a little shot of PGR which for anyone who doesn't know is just a straight forward racing game, safe to say it didn't go to well and most of the time they were both just sitting there getting annoyed because all their car would do was go around and around in a circle, so we decided that we should maybe give them something a bit easier to play, and seeing as they are both little boys we gave them a shot of Mortal Combat Vs DC Universe, it's your standard run of the mill fighting game and they loved it, i think they spent about 45 minutes just beating the crap out of each other, and hey i would rather them do it in a game than hitting each other outside of the game, which is also something they enjoy doing from time to time. But it was just so fun to see them sitting their playing with each other and not arguing about this and that, and like i said seeing as i am a gamer myself it's nice to get them started. I know that some parents don't like their children playing computer games, but i think it's a wonderful thing, as it teaches the children great hand and eye co-ordination and depending on the game itself it teaches them problem solving skills as well. Obviously you don't want them sitting in front of a TV all day playing, but i think a couple of hours every few days is quite alright. But what are your thoughts? Do you think 6 is to young of a age for children to be playing Video Games? or do you have the same thoughts as me? I would be really interested to hear your thoughts and opinions on it! But until next i shall bid you all farewell. I had to have a wee chuckle to myself yesterday when the boys came home from school, it all started after dinner and we were doing what we normally do and sitting around the couch watching some TV shows and just chilling out when Max informed us that for the second time in the space of about 2 months they had been given "High Vis Vests". Now this is great, i think it is absolutely brilliant that the school provide such things to the children, since in the morning it is extremely dark and because we have to cross a road having these would be fantastic. The only little snag in there whole plan was that the current autumn rain jacket and trousers that we purchased was already high vis. 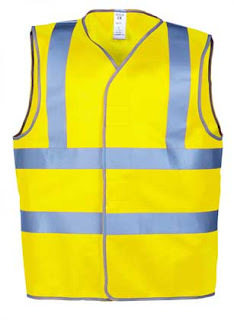 So i told the boys well you don't need them because you already have big bright yellow jackets and trousers so i'm more than sure that everyone on the road can see you a mile away, but apparently the boys teacher had informed the whole class that they MUST wear these things. So this morning i was getting them ready for school and i placed all there stuff on the the stairs like i always do jacket, rain trousers, boots, gloves, hat & scarf and went away to get myself ready so that i could take them up, but when i returned they were both just standing there. Of course my immediate reaction was to tell them to get a move on and to get there stuff on but then Max turned around and said to me "What about our other jackets we have to take" i tried to explain to them once more that they did not require them but they wouldn't let it drop so this morning they have gone out with high vis rain jacket & trousers and a high vis vest on top of that, i was honestly in fits of laughter. I guess i should be thankful i mean it was awsome of the school to provide them and i think all schools around the world should do so, since i'm pretty sure that not every child in the world walks to school in the dark with high vis rain jackets on etc but they looked like some sorry state this morning, i swear if god forbid a car does not see them and something happens i will honestly sue to the person and then pay for them to go and have there eyes tested, they both looking like like LaLa from the Teletubbies. 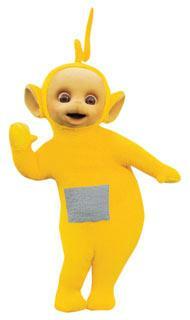 This is LaLa for anyone who doesn't know what the teletubbies is, but that is exactly what i kept seeing every time i looked down at them this morning, 2 little teletubbies walking away to school. So does the schools in your area provide these? would be interested to find out if they do or not, and if they don't i really think you should bring it up and maybe get the schools to provide them, i know some parents drive there kids to school but still they are always very handy especially when we are coming into the winter months and it is really dark in the morning and in the evening, but i would suggest if your child already has a high vis jacket of sorts to walk around in as his/her's normal jacket don't put one of these on them, it's cruel. Although my children love it for some odd reason, i think it's just the fact that they are new and you know what children are like with new things. But for now i shall bid you all farewell, until next time! So the other day Marie went up to put Max to bed and decided that she would stop in on our daughter and see what she was up to since we hadn't seen her since pretty much dinner time. It turned out to our surprise and without even having to ask her that she was sitting in her bedroom doing some studying, great i thought at least she's taking school seriously. However when i found out what she had to learn both myself and Marie were a bit confused i mean seriously what in gods name is the school trying to teach the children to become? DOCTORS? It turned out that the questions were all medical related, lucky for Mikaela that her mum is a nurse at the local hospital and deals with all kinds of patients, well not so much now since she has a new job as a Administrator but her knowledge is pretty damn good of different illnesses and diseases etc so Mikaela began to rattle of some questions that she was having problems getting answers to, i don't think she has realised that Google is her best friend yet but it was nice that she decided to ask instead of not bothering. But some of the questions were absolutely stupid i mean one was "Why does someone get leukaemia?". Seriously what type of stupid question is that?? nobody knows why people get it just some people are very unlucky and end up with these god awful illnesses, there is no rhyme nor reason to why it happens it just does unfortunately. I just don't understand why they are being taught anything like this though, i recall biology at school etc and not once did we go into anything medical, of course that was many moons ago so guess things have changed since then but i don't understand the importance in teaching them it, i'm more than sure if any of their family members had any sort of illness that they would already be informed about what it was and such likes but i don't see the point in it being in the school curriculum but perhaps that's just me. I guess i should be grateful that they are at least teaching the children something of importance rather than stuff that they don't really need to know etc but at the same point i'm still left wondering why? But i think that is enough for today, i hope everyone is having a awsome week! So until next time. As most people are aware by now every other weekend myself and my fiancée Marie get a nice kid free weekend, well it's not totally kids free since we still have our oldest daughter at home, but she is the typical teenager who just sits in her bedroom all day sitting online and watching TV etc, so we might as well be kids free. So i decided that i would have a awsome relaxing weekend and not stress about anything and what can i say it was fantastic. I started my Saturday morning out in front of the computer dealing with this and that and then decided that i would spend the rest of the day reading my book, since i had been going on about getting back into reading i decided that since it was so nice and peaceful in the house that i would take the opportunity to do just that. I think in total i spent around 4½ to 5 hours just sitting listening to music while reading my book and it was amazing. You know when you pick up a book and then you just get engrossed in it and can't put it down well that is how it was. After a good read we then had dinner and decided that we would sit and just chill out and watch a new series that i had downloaded called "FRINGE" which is some sort of Sci-Fi type TV show which actually kind of reminds me of the X-Files but without the alien stuff, but i have to say it's a really awsome TV show so if you haven't seen it before i would highly recommend you taking a look at it if your into Sci-Fi type things. Sunday was pretty much the same as on Saturday, got up and done some stuff around the computer and then sat most of the day reading my book, i don't know what the hell Marie was thinking but as i was sitting there having a nice relaxing Sunday she had decided that she would go outside, in the freezing and very wet weather and cut our grass. Granted it had been needing done since it was a jungle out there but the whole place was soaking wet so i just didn't see the point. So while i'm sitting in doors enjoying myself, my lovely fiancée was outside cutting our grass, some people would say that was a bit bad of me, but it wasn't my fault honest! It was also Fathers Day here in Sweden on Sunday, so i got a nice new massive mug for my cups of tea from my daughter which was also great, another reason why i won't feel guilty about not going out to cut the grass, fathers day should be a day where daddy gets to sit down and relax or at least that's my excuse! 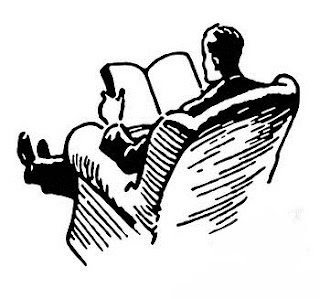 So that was my awsome weekend, i wished it hadn't ended in all honesty, i love having the kids home and stuff but when your able to just sit down with a good book and just relax and read without having to hear children argue and fight over the stupidest thing it is just really blissful. But i think that is enough for today, what did you guys get up to the weekend? anything exciting? I know it's possibly a little to early to start to even consider Christmas but in our household apparently that is the only thing on everyone's minds, or at least everyone except for myself. It's not that i don't look forward to Christmas because of course i do, there is no greater thing in the world than waking up on Christmas morning to see the look on the children's faces when they know Santa has came and left them all these wonderful gifts, and then you have dinner which is always amazing. I think to date the best dinner was 2 years back when my parents and sister made it over here to celebrate it with us, which i could imagine was rather strange for them keeping in mind that in Sweden we celebrate Christmas on the 24th and not on the 25th. I tell you something moving over from the United Kingdom and then finding out that is how it's done was a very strange experience to say the least but least my sister got her Birthday (24th December) and Christmas on the same day that year, i think it was more odd for her than it was ever for me. But around about this time of the year the children of course begin to get excited about it and on top of that the lovely TV decides that now is a great time to start advertising every single children's toy under the sun just to make it even more annoying, so last night the twins and our oldest came down with their lists for us to see and of course send of to Santa, safe to say they won't be getting sent to Santa just yet, i mean he's still sleeping ain't he! (Don't start laughing, you know he exists!) and we cannot disturb Mr Claus when he's fast asleep with silly letters, so these will obviously wait another couple of weeks before they get sent up to the North Pole! I'm still a bit confused because they have also mentioned that they both would like a new bike, which they won't be getting because they don't need one, their bikes that they have are only 2 years old and both look like they have just came out of the factory and are still a wee bit bigger than they require, so a bike is not something they are needing. Although i might have the type of bike wrong, since that is all they have written. 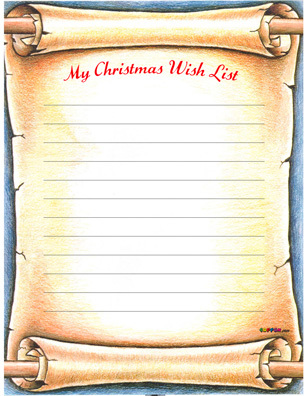 Our daughter though has as always got the insane list, i'm quite sure she sits online looks for the most expensive items in the whole world and says ok i want that, that and that i mean some of the stuff that she has mentioned she already has and yet she's added she wants new ones. 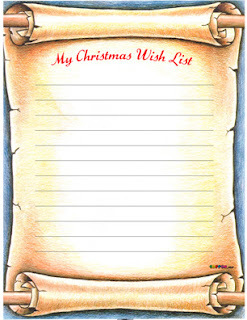 So yea the crazy lists are in and ready to head up to Santa's workshop, but what about you guys? have your children began thinking of Christmas or is it still to early for that even as the time fly's by, i mean we only have something like 6 weeks before Christmas is here. But for now i think i shall bid you all farewell and hope you have a great weekend, myself and Marie have a kids free weekend again since the boys are heading off to their dads so time for some well deserved rest and relaxation, lets hope that none of us end up sick again like last time. It came to me today while i was sitting around online that i really need to get back into reading, it used to be something that i loved doing but for some strange reason these last few months i have just not picked up a book, sure i take my book when i head into town for my job coach meeting but that is normally the only time i ever even look or think of looking at a back and i need to get back into it. The thing is, is that i need to make time for it and there lies the problem i know i have ample time to read without any problems but i'm always finding other things to do instead that are not exactly important, normally it's sitting down and looking around the internet for different things, or checking out blogs and playing games online and instead of doing all these things i could be sitting down with a book and doing what i used to love, reading but why don't i? I think my fiancée Marie put it best the other day when we were discussing something, don't ask me what because my brain is like a sieve half the time, i swear i would forget my own name if i didn't use it alot lol but during the conversation she said your a addict and she's right, i'm not a addict to anything bad or at least what i would call bad like drugs or alcohol but i'm a addict to things i get into. Take for example blogging, i always thought it was something i would never be interested in, because well as many of you guys can tell by reading my posts on a daily basis, my spelling, grammar and story telling abilities leave much to the imagination, sure i write some ok blog posts and people comment and like them, but i'm not the best and probably never will be (Lucky i just do it for fun). But when i got into blogging i started reading about, and looking for ways to increase my traffic, get more comments and such likes. This is pretty much how i operate, whenever i get into something i have to study it, read about and i end up forgetting things around me that i could be doing like reading, sure i'm reading things online and trying to learn more about whatever my addiction is at that point but it's not the same as sitting down with a great book and taking yourself off on an adventure, Marie even went out and bought me the "Game Of Thrones" collection (Still needing the last book, but got the first four) and i have only managed to read the first book and am still plodding away through the second, normally i would be finished them all by now but i just find myself doing other things instead. So i have decided that i need to get back into it, i want to get through all the Game Of Thrones books i have and get the newest one and get through that too, and then find some other series that i can sink my teeth into, i think reading is important, not only for children but for adults to because it takes you off into another land and it brings alot of enjoyment, or at least i believe so. I know there is many people out there that don't enjoy reading and think it's pointless but i for one am going to try and make more of a effort in doing it! 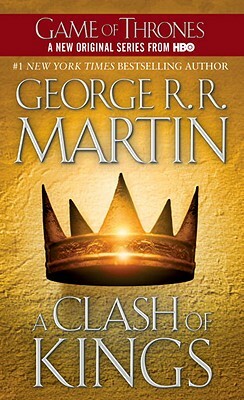 But for anyone who doesn't know about "A Game Of Thrones" series i would highly recommend you check it out, George R.R. Martin is a very talented author and i think if your into medieval/fantasy type genre's you will really get into this collection, and you should also check out the TV show that they brought out for the novel, it's only got one season so far, as season 2 will be released next year but the book and the show are both amazing. But for now i think i shall bid you all farewell, i'm going to head off and maybe just maybe pick up that book and start to read again! For a few months now i have been climbing the stairway to hell as i like to call it, actually it's a bit silly to be calling it that since i now no longer feel like i'm about to die when i reach the top but i found myself thinking for a few weeks now that perhaps it is time the boys went to school on their own, now of course i'm not talking the full way there because there is a busy road especially at that time of the morning when people are leaving for work etc but at least a small part of the way. So i decided on Monday that i would try it out and see how it went, i mean there is really no reason for me to walk all the way up to the school and enter it just to watch the boys take off their jackets and footwear and say goodbye, because i can say goodbye to them when i drop them off and watch them head off, plus i think this gives the boys a little bit of independence, i don't know if i'm right but i think it's good for them to feel that it is their responsibility to get themselves into the school premises. My big plan was to walk them all the way up to the staircase and then let them head off themselves up the stairs and into the school yard, basically for anyone who never read my "I Have Met My Nemesis" post a while back it basically goes the path then the staircase followed by the actual school yard but as we were walking up towards the stairs i started to get a horrible feeling in my stomach, i don't know if it's just the fact i have been walking them all the way for so long that i found it hard to let go but i just couldn't do it, i know it sounds stupid but i looked up that staircase and seen how dark it was and i came to realise that i would not be happy until i seen that they had made it up there themselves, so i decided to make a edit to my little plan and took them all the way up the stairs and left them there, at least that way i know they had made it to the school yard. Again i know it's stupid since the staircase leads directly onto the school yard, but it was dark and it's covered in tree's and bushes and i just didn't like it but i think that is just me having issues letting go, but i took them up and said my goodbyes at the top the staircase. The boys were actually pretty surprised that i wasn't going all the way with them and began to ask me why, was i having to go and get myself ready for something or was it something else that was stopping me from taking them all the way. But after my reply off "You don't need me to take you into school your both big boys now" i could see that little smile on their face, they both seemed to have this small realisation that they were big boys now and couldn't have been more happy about it. This little plan of mines has actually worked out rather well for everyone now including our little Siberian Husky Kaiser, because normally i would leave him home and have to take the boys to school before i came back to pick him up for his morning walk, but now i can actually take him with me and add a little extra time to his morning walk and it allows him to walk with the kids as well which he doesn't get to do that often so all in all it really worked out great. But what do you guys think? i mean they are only 6 years old and i still get this feeling i'm doing the wrong thing, but seeing the look on their face when they get to walk up the tiny wee hill to the school doors on their own is just brilliant, they are so happy about it. But i think for now i shall bid you all farewell, so until next time have a great day! At the end of last week i made a blog post asking my fellow bloggers and followers to give me some hints, tips and some recipes to help me get started cooking, the reason behind this was that Marie my fiancée became very ill on the Thursday and it occurred to me that i had no idea how to make dinner for myself or for the kids, because i have been so reliant on Marie to take care of that type of thing. So feeling a bit down i decided to call upon everyone and then yesterday after a horrible day in town doing the weekly food shop i came home and decided that i would give cooking a whirl, and what better dish to start off with than the American classic Mac 'n' Cheese! I have no idea why i wanted to make this but i have seen it on several cooking shows like Master Chef etc and it has always appealed to me and i have always said every time that i see it, i really want to make it, so yesterday my adventure into the land of cooking began. 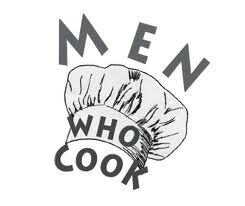 Let me first start off by saying, anyone that thinks cooking is easy is absolutely insane! It is now on my top 10 list of the hardest things i have ever done in my life, i honestly can't believe people that do it as a profession or on a daily basis. You would think that following a recipe would be one of the easiest things there is but when there is more than one step for example: Stick X in oven and wait 20 minutes it becomes a bit overwhelming, well at least for my first time it did lol. Not to mention the strength it takes, i honestly can't understand now looking back to the chef's that i have seen who are not exactly in the best shape of their lives how in gods name they manage to stir a pot of "x" for "x" minutes. Preheat oven to 400°F Cook and drain macaroni according to package directions; set aside In a large saucepan melt butter. Add flour mixed with salt and pepper, using a whisk to stir until well blended. Pour milk and cream in gradually; stirring constantly. Bring to boiling point and boil 2 minutes (stirring constantly). Reduce heat and cook (stirring constantly) 10 minutes. Add shredded cheddar little by little and simmer an additional 5 minutes, or until cheese melts. Turn off flame. 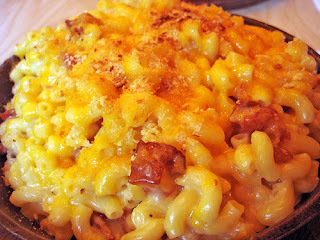 Add macaroni to the saucepan and toss to coat with the cheese sauce. Transfer macaroni to a buttered baking dish. Sprinkle with breadcrumbs. Bake 20 minutes until the top is golden brown. (You can also freeze this recipe in zip-lock bags for later use - once you have mixed the macaroni along with the cheese sauce allow to cool to room temperature before adding to your freezer - I generally pull it out the night before and allow macaroni and cheese to reach room temperature; I then add the macaroni and cheese to a buttered baking dish, sprinkle with bread crumbs and then bake for 20 to 30 minutes, until golden brown on top and bubbling. Now it seemed simple enough nothing to challenging, or at least so it would seem, the whole put this in a saucepan and stir for 2 minutes constantly followed by adding this to the saucepan and stirring for a further 10 minutes constantly wrecked my arm, admittedly i got Marie to help me out and take over some of the stirring and adding stuff while i stirred because I DON'T HAVE 3 ARMS! It turns out that i made some fundamental mistakes as i used the same pan that i had just cooked the macaroni in to then cook the sauce let me just say DON'T DO THIS! i didn't put 2 and 2 together to come up with 4 and realise that adding butter to a already heated pan would make it stick no matter how quickly i was at stirring it, but i managed to salvage it and get the sauce to come up pretty nice if i don't say so myself, but next time i do this i will make sure to cook the sauce and the macaroni in 2 separate pots, i also think i made a slight error with the top crust, either that or we don't get the same breadcrumbs over here that you do in the states, but although some of it got hard and nice and golden brown after 20 minutes there was still alot of loose breadcrumbs lying around, so i think i maybe never added enough butter on top with the breadcrumbs or maybe i wasn't meant to do that at all, but that is what Marie had written so i followed what she wrote. All in all it actually turned out really well, myself and Marie enjoyed it and the kids well you know what some children are like with trying new things, it looks weird and i don't like it! But i think i shall try it again and perhaps make a small batch without the breadcrumbs since that is what my oldest daughter and Alexander (one of the twins) didn't seem to like about it, and see how it turns out, and perhaps add a little extra cheese just to give it a little more cheesy flavour as i felt there wasn't enough cheesy flavour in it, although that was perhaps because of my small mistake with using the same saucepan twice without letting it cool down. But for my first ever time attempting to cook a dish from scratch, i think i did a pretty damn good job! Granted i got lots of help from Marie, but i think i will be confident enough next time to perhaps do it all myself, especially knowing now what to do and what not to do. But for now i think i shall bid you all farewell and leave it there, so until next time! I had got a phone call the other day from my job coach to schedule a new meeting since she had been sick for our last one and it has now been 3 weeks before our last appointment. With Marie being sick she decided to take it upon herself for some revenge. How did she get her revenge? 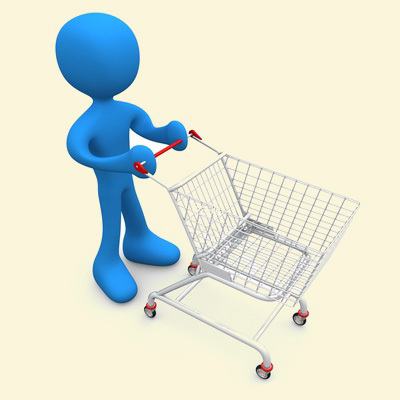 She gave me the weekly shopping list and told me to go and get the shopping done. Marie writes things like "Sausages" now everyone is probably thinking ok, what's the problem with writing sausages, well in Sweden going to buy sausages is like going into a liquor store to buy beer, there is about 300,000 types of sausages, so when someone in Sweden says or writes go buy sausages i'm like WHAT BLOODY TYPE??!??! It is the same thing for bread, if she asks me to go and buy bread i am literally totally bloody lost, i have no idea what type of bread because in Sweden you have about a million different types of bread, from normal loafs to bread that is like rock solid hard, you probably get it in another places around the world as well, but certainly in the UK buying bread is a easy task, but in Sweden it is like doing a mathematical equation. People shopping in Sweden annoy the hell out of me, literally you are walking down a isle and next minute your stopped dead in your tracks by a shopping trolly, just sitting there with food and all sorts in it, the trolly apparently doesn't have a owner because there is nobody around until you see someone 4 isles over walking back to it, like WHY OH WHY would you leave your damn cart in the middle of another isle and go off on to another one?? I'm totally confused! I've actually had tendencies to take there trolly and walk away with it and place it somewhere stupid in the supermarket just to teach them a lesson. I honestly could go on and on with this list, and probably fill a book with reasons why i should never go food shopping but i think i will stop there because i think everyone gets the idea, i'm guessing that i am probably the only person in the world that has all these problems but if i'm not share your food shopping hates! So i feel like i am not alone lol. But until next time... i shall bid you all farewell. 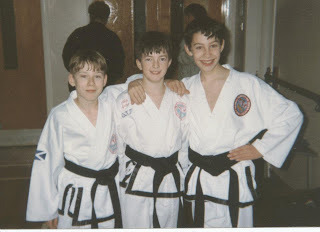 The other day i was checking my Facebook feeds like i do normally and i came across something that just blew my mind away, a very very old friend of mines who used to train me when i was doing Taekwon-Do had found and posted up some pictures from decades ago and i just thought i would post them up here. It's really amazing that when you see pictures from your past you wish you could relive those moments, what i wouldn't give to be 13 again. That's me on the right, wasn't i cute? Errrr no! 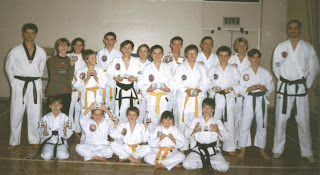 This picture was taken just after the Black Belt grading that myself and Ian, the boy on the left hand side had just attended, i have to say that was the most scariest experience i have ever been through, mainly for the fact that the gradings to obtain your Black Belt was done by a 5th Degree Black Belt Master and trust me that guy could put the fear of life into anyone. 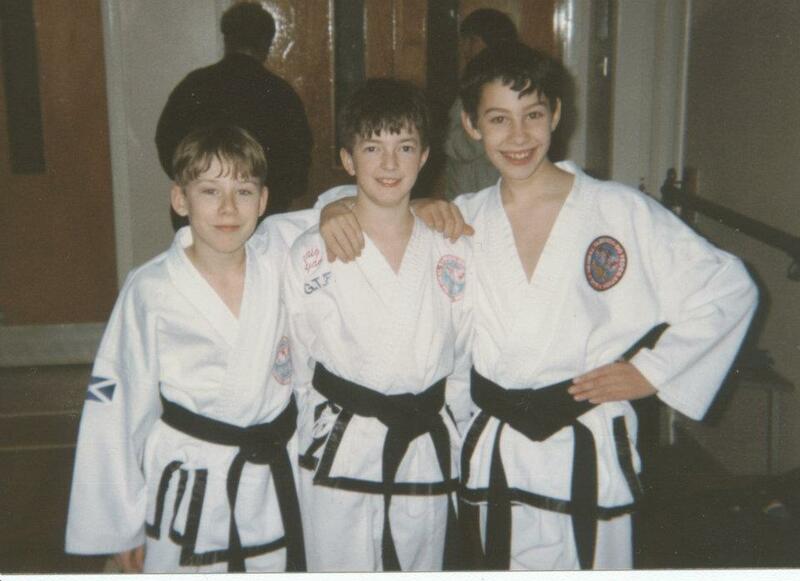 What was even more scary than attending my Black Belt grading, was that only 2 weeks after passing it and getting my black belt (Aged 13!) i then had to attend the European Championships where i went up against a American boy who i believe was probably around 15 in the sparring event, let's just say i wasn't really prepared for such a event especially since i had just got my Black Belt. The American boy absolutely destroyed me all i can remember is being kicked over a chair into one of the judges and pretty much the rest is a blur of being kicked this way and that way, it was a great experience though. Although i didn't to do well in the sparring section i did really good in the patterns and managed to take away a Silver medal, which for being my first ever Black Belt competition is pretty impressive if i do say so myself. See if you can spot me! tip look at the other picture up top. I'm not actually to sure when this picture was taken, i know it wasn't after the European Championships so it must have been after a lock competition that my club had attended, but it's just funny to see some old faces you know. The tall guy on the right hand side is Mr Stephen Gell and was my training instructor since the day i joined, there is not another man in this world that i looked up to more than him (Well except for my old man of course), he was such an amazing man and instructor and was always there for me, i don't know why i guess he seen a little bit of himself in me, but for that i will never forget him. 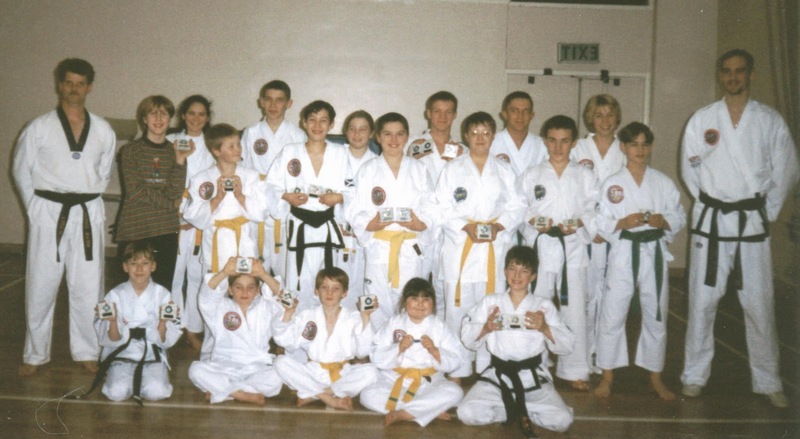 The other man on the left hand side was our other instructor Mr Terry Ryan, i actually became very close friends with his son Craig who is the black belt sitting in the front row on the right hand side. I used to practically live at their house during the summer months just messing around and talking Taekwon-Do and getting up to stupid stuff with him, but it was a great time. I am so happy that these pictures got posted, as it really takes me back to such happy times in my life, i just wished i was still doing it but perhaps one day i will get back into it! But until next time... i shall bid you all farewell, have a great day folks! A few days ago i made a blog post asking everyone's opinion on allowing children to make their own decision about what sort of haircut they should get, the reason behind this was the fact my son Max wanted to get a Mohawk, something he had been going on about for at least 4 years now i think it was. 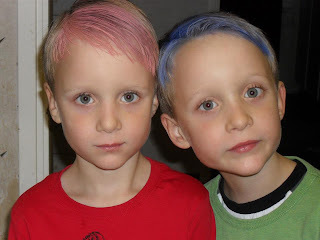 Personally i was of the belief that children should not make any decisions when it came to this, simply because they would end up with the most ridiculous and insane haircuts that you could possibly imagine, but alot of people who decided to reply to the thread had some of the same thoughts but went about it in a different way and some they thought it was fine, aslong as it was not in the school year. So i gave all this information i had been given much thought and decided that possibly we should maybe compromise just slightly and see what would happen. Thursday came around and it was time for the boys hair appointment, we normally just get it done here in Järpås since travelling all the way to Lidköping (Biggest town closest to us) would just cause us more issues due to the public transport not exactly being the best and seeing as i don't have a drivers licence well that just means we are reliant on it. But off they went to the hairdresser who i believe has been cutting the hair of the cavemen in town since the beginning of time (Yes, she's a pretty old woman, and her haircutting is well mediocre to say the least), and well this is what they returned with. First off, please do not ask what in gods name is up with the comb over as i have no idea and trust me it was rectified very quickly but instead of allowing them to get crazy Mohawk's and such other disastrous haircuts we allowed them to colour their hair, i really don't have to much of a problem with this mainly for the fact the hair dye that was put in their hair washed out after 2 washes so it wasn't something they would have for weeks, and well it made them think they had their own way. So Max didn't exactly get what he was looking for but at least he got something that he wouldn't normally get i guess, and Alex well he's not all that bothered as to what type of haircut he gets aslong as it's cut he's a happy camper. But i think that is it for today, what do you think of their stylish new hair? obviously now it's back to being the normal dirty blonde that they have but at least for a few days they were happy. But for now... i think i shall bid you all farewell, and hope you have a great day, i'm still getting over this flu cold thing i have and Marie well she's been hit hard with it and is a complete train wreck at the moment, although surprisingly still going to work, even though she looks and sounds like death.